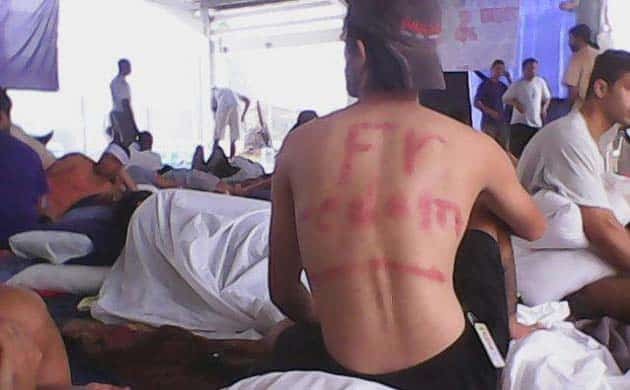 The hunger strike on Manus Island is now in its tenth day. For ten days, over 700 asylum seekers have maintained the most desperate protest against the brutality of Australia’s offshore detention regime. Detention centre operators Transfield and the Immigration Department have used the most savage repression in an attempt to break the protest. Over 200 people in Delta Compound were deprived of drinking water for 24 hours before scores of Australian guards and Wilson’s Emergency Response Team broke into the barricaded compound to arrest supposed ringleaders. Over the next few days, there was a witch-hunt through all the compounds, to arrest more ringleaders. Being accused of sending messages or photos was enough to be arrested. Up to 100 asylum seekers and refugees are now in Lorengau Prison or being held in the detention centre’s notorious Chauka isolation unit. Tony Abbott declared that a “major challenge to the policy of the government had been defeated”. But, the day after the arrests, more people defiantly joined the hunger strike. The hunger strike has managed to prevent the proposed 22 January forced removal of refugees to insecure, temporary housing in the Lorengau settlement on Manus that triggered the protest. But the cost has been high. Around 40 people have stitched their lips together. Hundreds of asylum seekers have been treated for dehydration and the number of more serious self-harm, and attempted suicide, incidents are increasing. On the ninth day of the hunger strike, two people attempted to hang themselves, two swallowed razor blades and one swallowed a pair of nail clippers. Earlier on, two people had to be medivacced to Port Moresby, one after swallowing razor blades, another washing powder. Even though footage and messages of the protest were pouring out of Manus Island, for two days, Immigration Minister Peter Dutton denied there even was a protest. The Australian government has gone to great lengths to make it seem that Papua New Guinea is in control of the detention centre. When Transfield guards broke into Delta compound, they even had the PNG chief migration officer Mataio Rabura on hand. But they couldn’t get the story straight. At first, the media was told the chief officer negotiated a peaceful resolution. The next day, Dutton admitted that force had been used. The day after, a PNG government spokesperson told the ABC, that “asylum seekers did not use weapons during the intervention [into Delta compound]”. When the offices of Charlie Hebdo in Paris was attacked, Abbott proclaimed, “I believe in free speech —I absolutely believe in free speech.” But not on Manus Island. The asylum seekers on Manus Island have suffered the most stark discrimination. Firstly they were arbitrarily singled out for removal to Manus when they arrived on Christmas Island. Thousands who arrived with them on Christmas Island will now be processed and resettled in Australia. The brutality on display on Manus Island is the inevitable result of the war that first Labor and now the Coalition have declared on refugees. They have been kept in appalling conditions over the past 18 months. In that time, there have been just 71 positive refugee determinations. And no one has been resettled. One year ago, Iranian asylum seeker Reza Barati was killed and scores of others suffered savage injuries when PNG police and local detention staff attacked the detention centre. In September, Hamid Khazaie died as a result of medical neglect. That reality hangs like a nightmare over Manus Island. Any more deaths on Manus will also lie at the feet of the Abbott government. There will be no justice for the asylum seekers until Manus Island (and Nauru) are closed.